It suddenly hit me that November is already here and Christmas is just around the corner. Every year I say I'm going to start earlier and really be ready for Christmas, but I just can't seem to even think about it until Halloween is over. I was inspired by this example I saw online and followed it as an example. I made my wider (a full 12" in the middle) so that my tags would be big enough to write on. I like that the tags are completely removable and seperate from the numbers, so that I can decide exactly when I want each activity to happen, depending on our schedule for December that year. 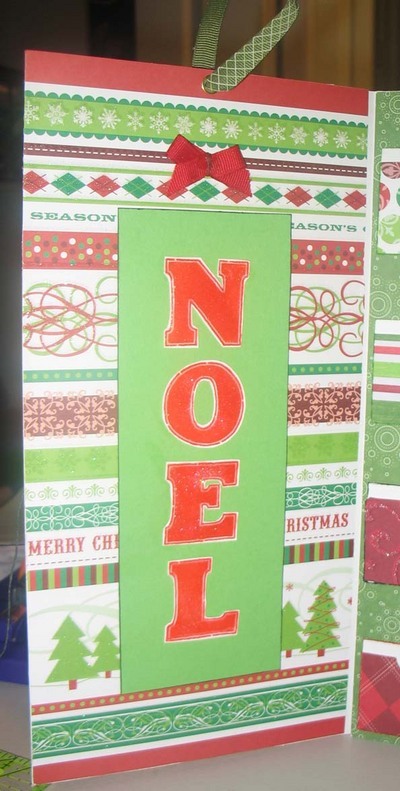 Materials used: Die Cuts With a View Glitter Christmas Stack, CTMH cardstock, CTMH ribbon, CTMH stamps and inks, CTMH fiber, Liquid Glass, glitter, pop dots, misc brads, etc. A Wishblade or similar electronic cutting system will be helpful but not absolutely necessary if you don't mind some hand cutting. Unfortunately I didn't think to take photos for each step, but I'll try to describe each step. Score the two B papers at 6". On one of the sheets, the left side will show, and on the other, the right side will show. Lay paper C face down on the table. Take one paper B and adhere the front of it to the wrong side of paper C, so that the score line at 6" is at the left edge. Paper B will extend 6" past paper C and fold back over it. Do the same thing with the 2nd paper B on the right side of the paper C.
Take paper A and adhere it in the middle, between the two score lines, covering the seam created by the two paper Bs. In the end, half of each paper B will be sandwiched between papers A and C. The other half of each paper B will fold over, meeting in the middle to cover paper A. The front closure needs to be done before the inside. I punched two circles (1" I think) from light green, and four smaller circles (3/4" I think). I adhered two small circles and one large circle together in a stack, and then attached the snowflake with a brad, through the three circles AND paper B. The smaller circles give a little space for the fiber to fit under. Repeat with the remaining cirlces on the other side. Wind some waxy flax around the left side for a closure. When the inside is done, it will cover the prongs from the brads. To cover the wrong side of the scored paper used for the cover, I cut another piece of 12x12 cardstock, paper D (the striped cardstock in the above photo), in half and adhered one to each side. But before you stick it down, see the grommet in the top with the ribbon through it? I wanted it to look finished on both sides, so I put a grommet in paper D and a 2nd grommet in the cover (paper B) each facing the right side of the paper. Then I adhered paper D to paper B, and threaded the ribbon through. Repeat this on the right side, so a total of 4 grommets will be used. Cut out the letters and adhere to green cardstock (I forget the size, I think there's about 3/4" around all four sides) and inked the edges with dark green ink. The envelope on the right side for holding the leftover tags took me a lot of time. I had to create the template for the envelope and I'm not very good with spacial thinking, and I wanted it to be thick enough to hold all 24 tags, so it's actually 1/4" deep. I used my CraftRobob (similar to Wishblade) to cut out the envelope. I originally intended to just make it red, but ended up lining it with green paper, to cover the wrong side of the brads. So, once you have a piece cut out of each green and red, put the brads into the red paper. Leave them a little bit loose so there's room underneith them for the fiber for closure. It's easier to do that before you assemble the envelope. Once the brads are in, assemble the red and green envelopes separately. 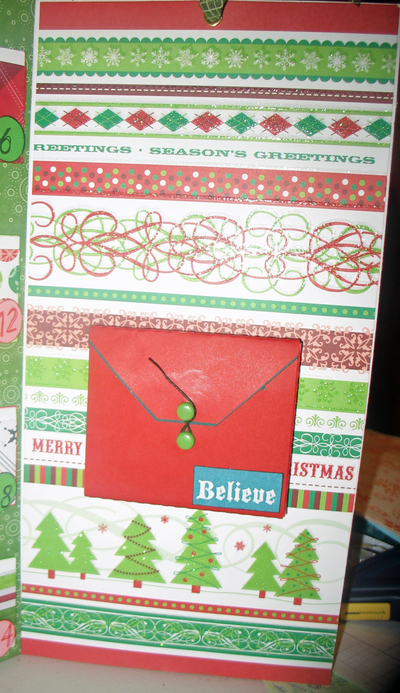 Then put the green envelope into the red envelope and adhere. It's a tight fit (because they are cut the same size) and the green pokes out of the red a little. You could make the red template a smidge bigger if you wanted to keep the green totally inside. The Believe tag was simply cut out from one of the papers included in the DCWV stack. I wrapped some CTMH waxy flax around the brad in the flap, to use as a closure. The tags are simply punched out using the Marvy punch on dark green paper and inked with black ink. Then I punched squares (1 1/4" I think, I'll have to check) from light green paper and inked with red ink and wrote the activity with a red pen. Adhere the light green squares to the tags and add fiber. The folders I also used my CraftRobo for. Cut them out and assemble them. I inked the edges because the white from the back of the paper showed through the scored edges and I didn't like how it looked. 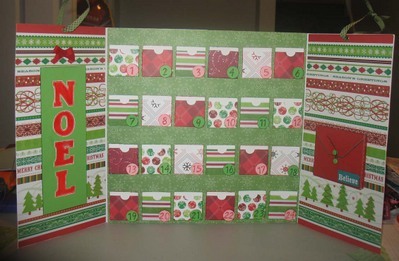 I punched 12 pink and 12 light green circles (3/4") and inked in red and green, respectively. Then, alternating numbers, stamped in red and green, respectively. 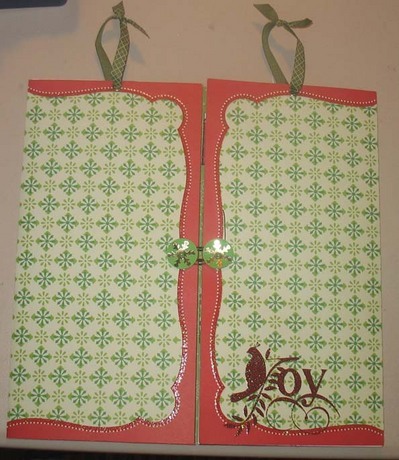 Adhere to folders with pop dots. Adhere folders to paper A evenly, 6 across and 4 down. I drew lines with a vanishing ink pen and eyeballed the placement of each folder within the grid. 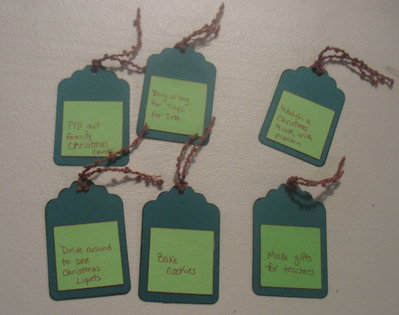 Here is the list of activities I wrote onto the tags. 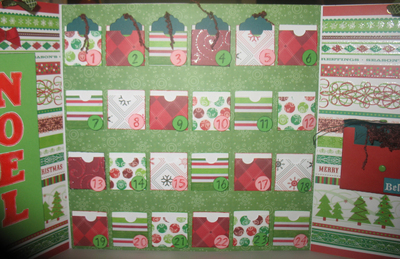 I also plan to make some extra, blank tags to keep with the calendar, to make new activities as our family grows. This way I won't have to worry about having the same supplies to match several years down the road.